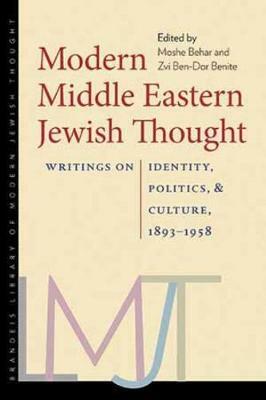 This volume opens the canon of modern Jewish thought to the all too often overlooked writings of Jews from the Arab East, from the close of the nineteenth century to the middle of the twentieth. Whether they identified as Sephardim, Mizrahim, anticolonialists, or Zionists, these thinkers engaged the challenges and transformations of Middle Eastern Jewry in this decisive period. Moshe Behar and Zvi Ben-Dor Benite present Jewish culture and politics situated within overlapping Arabic, Islamic, and colonial contexts. The editors invite the reader to reconsider contemporary evocations of Levantine, Mizrahi, and Arab Jewish identities against the backdrop of writings by earlier Middle Eastern Jewish intellectuals who critically assessed or contested the implications of Western presence and Western Jewish presence in the Middle East; religion and secularization; and the rise of nationalism, communism, and Zionism, as well as the State of Israel.